Forest ecologist Christian Marks is dwarfed by one of the oldest elm trees in Massachusetts. 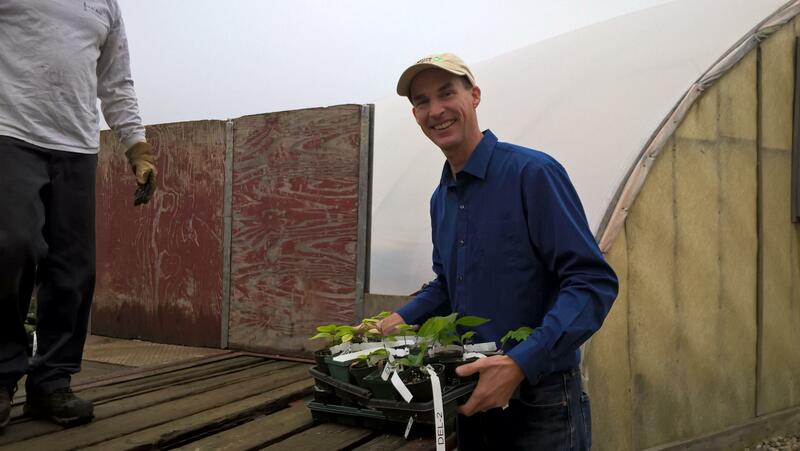 Christian Marks, forest ecologist with The Nature Conservancy, moves elm seedlings from a greenhouse at UMass Amherst to their next growing destination. 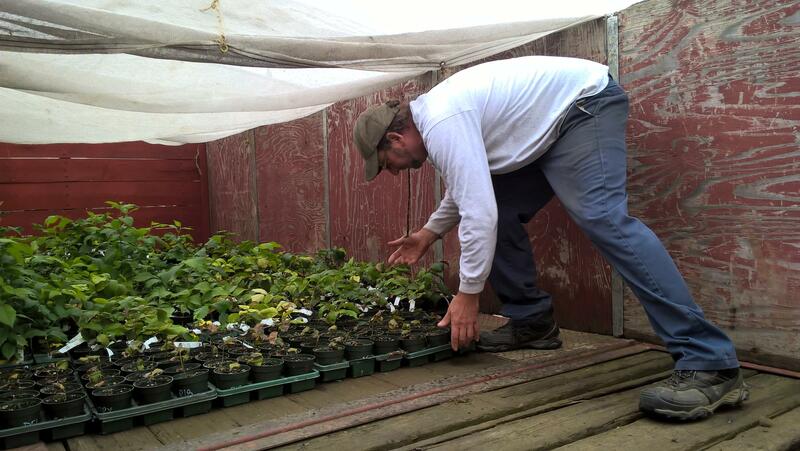 Glenn Cutting loads up elm seedlings to bring to his nursery in Gill, Massachusetts. 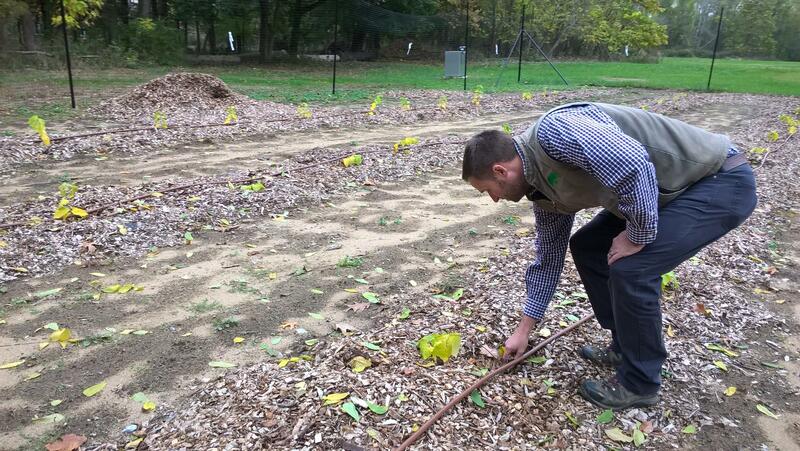 Alexander Sherman, assistant tree warden, City of Springfield, looking at elm saplings planted in Forest Park nursery. Now, as beetle invasions and new disease are threatening other tree species, ecologists are engineering a comeback for the elm, whose history in the U.S. goes back to the earliest settlement by Europeans. Thomas Campanella wrote about that history in his book, "Republic of Shade." He said one of the reasons Americans planted so many elms to begin with was part of an effort to reconcile nature and artifice, in the countryside and in the city. “Charles Dickens actually talked about this when he visited New Haven,” which was known as the city of elms, Campanella said. Dickens wrote that the elms “bring about a kind of compromise between town and country, as if both sides had met halfway and shaken hands upon it,” Campanella told Wisconsin Public Radio when his book came out in 2004. The elm is a fast growing tree and can establish itself in city and forest. But a century ago, Dutch elm disease, which usually attacks the tree through a beetle, felled millions. But not all. On a neighborhood street in Amherst, Massachusetts, ecologist Christian Marks stood in front of an enormous American elm. It's an old tree, about 100 feet tall, settled in a front yard at the edge of the sidewalk. Many old elms, like this one, that have survived over the years been treated with an anti-fungal, Marks said. And when a mass of trees started to die off and had to be cut down, a certain beauty was lost. “When there were still avenues where the whole avenue was lined with elms, they would connect above the street,” Marks said. “There would be street branches all above you. And it felt like the vaulting ceiling of a cathedral." Marks is a researcher at The Nature Conservancy in western Massachusetts. He is among the ecologists working with the USDA’s Forest Service to grow and plant a new population of disease resistant elms. The goal is to plant them in cities and along riverbanks, in floodplain forests. It's a large-scale restoration effort and will take years, but the trees are on their way. On an autumn morning, Marks and others moved dozens of potted elms out of a greenhouse at the University of Massachusetts Amherst onto a small truck bed. “We're taking them from this size container and putting them in a bigger one,” said Glenn Cutting, who owns a nursery in Gill, Massachusetts. He said the trees will grow there until they’re about six feet tall. Some of these plants Marks started from branches. Looking over the trays, he said the more plush-looking plants came from a certain combination of seeds. "You can see the label here, where this is the mother, R-18-2," he said. "It’s a highly tolerant selection, and then number 65 is a tree from New England that was was really big, and lived a long time despite Dutch elm disease being all around it." He suspects this combination will make this a disease tolerant tree -- and through more growing and planting, he said they’ll know for sure. Reestablishing the elm tree in New England and elsewhere sounds like a lot of engineering. It is, said Marks. And it's to give the species a boost. The goal is to get the elm to a point where it can resist pathogens. Researchers say it could become a replacement tree for other species in jeopardy like maple, vulnerable to the Asian longhorned beetle. In 2008, the beetle infested Worcester, Massachusetts, and 35,000 maples had to be cut down. Another pest, the emerald ash borer, has killed off millions of ash trees around the country, and is moving up the Connecticut River Valley. An American elm tree in 2012 at Spring Grove Cemetery in Hartford, Connecticut. Working with Marks to keep an eye on a bigger picture is Keith Nislow with the USDA’s Forest Service. “Our strong focus on entomology, and pest and pathogens allows us to do robust projections about what would be lost,” Nislow said. Nislow described those losses as "goods and services" that come from nature's complex systems. From the top, it’s shade and cooling. At a lower level, tree roots intercept and filter pollutants that get into groundwater and rivers, like car oil, animal waste and farm fertilizer. “So we have a pretty good idea of what species can come in …and provide those services,” Nislow said. Right now, that's the elm. 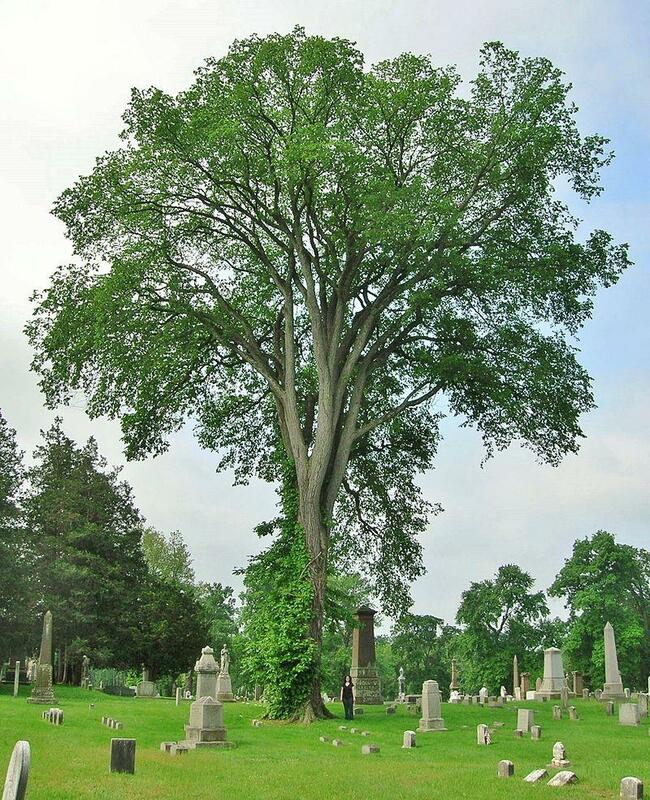 Like a few others, the elm has always been a more bang-for-your-buck tree that can thrive in wet forests and tolerate dry city life, and some are already growing in Springfield, Massachusetts. Alexander Sherman, assistant tree warden for the city of Springfield, Massachusetts, looks at elm saplings planted in the city's Forest Park nursery. Alexander Sherman is the assistant city forester. On a gray afternoon, before any snow has covered the ground for the season, he looked over a planting field filled with a variety of species, including about 100 elms. This planting field, in the city’s Forest Park, is one of several New England locations where Marks’s trees get a chance to grow. They’re still small. It will be another five years at least before they're planted in the city, said Sherman. Springfield has been planting disease-resistant elms since 2006. About 400 trees have been placed around the city and are doing well. What began long ago as a New England street tree appears to be taking hold again. The destructive emerald ash borer is moving deeper into New England's tree population. An infestation was just found in Hampshire County in western Massachusetts.